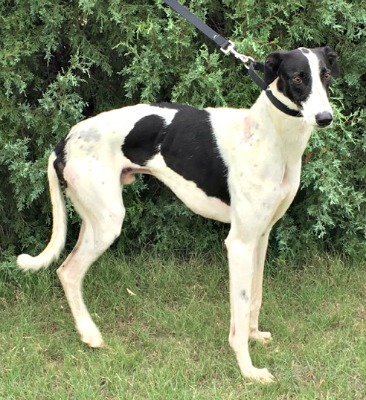 Dodge is an approximately 2 year white and black male greyhound found as a stray in the Amarillo area. Dodge is very thin and has a positive titer to Ehrlichia Canis. Treatment has started and will be continuing for about 6 weeks. Dodge is not considered cat or small animal tolerant, but he is chicken tolerant. Dodge walked up to a farm house east of Amarillo. The home owners offered him food and water. Their home does not have a fence. That evening they opened the garage door where he entered and sleep in a empty dog bed. The next morning he was let out. As the wife drove off to work he followed for about a quarter mile and returned and waited for her return. Each morning the farmer let chickens out. He is chicken friendly. Dodge slept in the garage and was let out each morning able to run free. He choose to stay there. Dodge's blood tests indicate he has been successfully treated for Ehrlichia Canis, and his PCR test is negative. This boy has completed all his medical procedures and is ready to find his forever home! 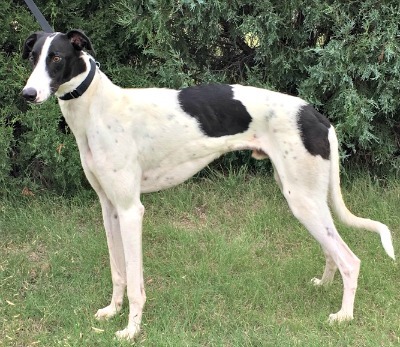 Dodge is a very handsome boy, smart, fun loving, a leaner and loves attention. He plays with other dogs but sometimes doesn't like to share his toys. He will play fetch until you cannot throw the tennis ball anymore or he chooses to hide with it in the shade. Dodge is very curious and loves to know what you are doing at all times – a real Velcro hound and will puff his cheeks when watching you do something. He does cuddle when he has time. At meal time Dodge can be a bit snappy so we crate him while it is being prepared. He helps with everything, everywhere. I'm sure with training he could do most anything. He's very smart, good boy. Dodge will make someone a most fantastic houndie in a home with no cats and no small dogs!!! The special medical treatment cost needed by Dodge is why the Miss Mesa Fund was established. If you would like to help with Dodge's care, please take a moment to make a donation to the fund. You WILL and CAN make a difference in Dodge's life and the lives of other greyhounds in need of special medical care. Your help and support will make a difference - one greyhound at a time. Please note Miss Mesa Fund/Dodge on your check.